This is a six-event tour comprising a maximum of 32 players who have previously qualified. At the end of the season a promotion and relegation system with the Regional Junior Tour will be determined based on number of eligible players from the PJT and RJT. 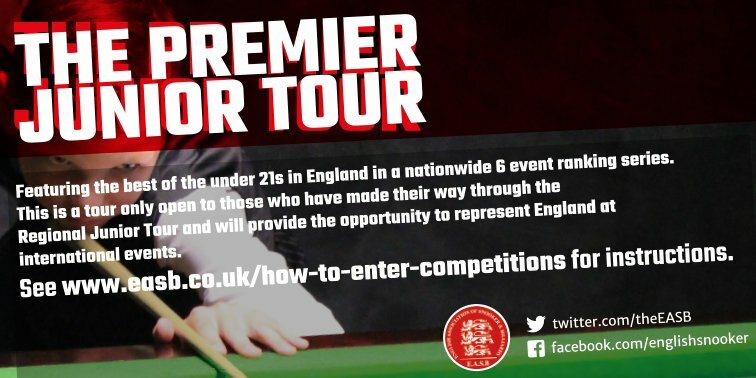 There will be £1,000 from the competition sponsor, Regency Pro Tips, plus 10% of entry fees which will be put towards the international players’ fund for international junior events. Open only to pre-qualified players who are members and aged under 21 on 31st December 2018. Best of 7 KO throughout with the option of a best of 3 plate competition for first match losers. Formats may change dependent on entries. Players receive ranking points from each event with all 6 events counting to the final ranking list.